It's something different! Immerse yourself in off-the-beaten-path experiences in naturally beautiful locations, from Alaska and the Hawaiian Islands to Mexico's Sea of Cortes. 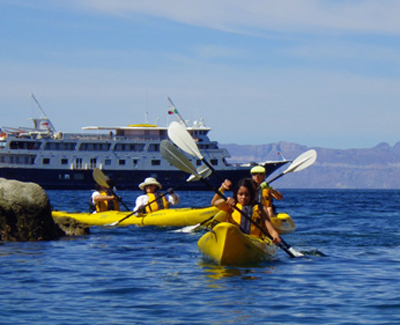 See all the photos and travel inspiration in the new 2016 UnCruise Adventures e-brochure! Unrushed. Uncrowded. Unbelievable! As an alternative to traditional cruising, UnCruise Adventures gives you unmatched and unbelievable access--explore waters inaccessible to larger ships, step ashore in small communities for exclusive interaction, and get up-close with wildlife. Filled with unspoiled encounters, our voyages focus on activities and excursions that complement the wilderness, wildlife, and culture of the places we visit. Experience authentic culture; untamed marine life; included tours or hiking, kayaking, paddle boarding, snorkeling, and skiff excursions. On board, relax on the upper deck, mingle in the lounge, or chat up the captain on the bridge. Carrying fewer than 90 guests, our nimble fleet of expedition vessels, yachts, and a replica turn-of-the-century coastal steamer serves as your home in Alaska, Mexico's Sea of Cortés, the Hawaiian Islands, the Columbia and Snake Rivers, and the coastal waters of Washington State and British Columbia. Change the way you see the world.